I've been dying to do a makeover for my blog for quite some time now. Sure, it was very simple and classic looking, but I wanted something a bit more colorful and fun. In honor of my blog makeover, I'm going to share with you one of the best recipes I have come across in a long time! I bookmarked this particular recipe several months ago. My only regret now is not making it sooner!! I promise that this is something you need to try! It's about as simple as simple gets. You simply slice some potatoes, toss them in olive oil, salt, and pepper, then bake them in the oven for about 15 minutes. Next, top them with some barbeque sauce, cheddar cheese, and bacon bits. After a few more minutes in the oven, you've got the tastiest potato side or appetizer you've ever eaten! I made these two times in two days they were so good! My husband calls them crack :) I would bring these to a party any day over the alleged "crack dip." Cut potatoes into 1/4 inch slices. Toss the potatoes, olive oil, garlic salt and pepper in a big ziploc bag to coat the potatoes. Arrange potatoes in a single layer on the baking sheets. Bake until lightly browned, about 15-20 minutes. Brush with barbecue sauce, then top with the shredded cheese and bacon bits. Bake until the cheese melts, about 3-5 minutes. Top with sour cream, if desired. Jamie, the blog looks awesome! Jaime those potatoes look amazing and I KNOW they taste even better as I make a couple of different versions of the them. I've not added the BBQ sauce I'll have to give that a try. If you like onions and peppers I've sauted bite size pieces of them along with the potatoes. Just thought of something mushrooms would probably be good too. Okay we're having some with dinner tomorrow! These look delicious! I will definitely have to make them. I love the new look! I LOVE LOVE LOVE your blog makeover. The blog looks absolutely fantastic. And what a perfect recipe to christen the new blog. These southwestern potatoes look divine. I can't wait to try them (now that you've convinced me that I need them in my life)! Wow...those do look like quite the tasty little bites! The new look is wonderful. The new blog is very fun! Love it! Your blog looks great! The potatoes...oh my gosh! Marking this right now as a MUST MAKE! Thank you! I just made it, it was so delicious. Too bad I don't have bacon and the bbq sauce, it was still good. Next time will definitely make it with bbq sauce and bacon. I love the new blog look! The potatoes look great too. Congrats on the new look! Looks great and these look delicious! Those potatoes look so good! I like the new look! I love the blog makeover.. I need one so badly! Those potatoes look so addicting and delicious. The blog looks super cute and the potatoes look even better! so cute--I love the blog makeover! Ooh, those look fantastic. I wonder how they would be without the barbecue sauce (which I don't like all that much). I love the new look, so fun! These potatoes look so cheesy and delicious! Now these are the way to a man's heart! Wow. Love your new look! It is really fab and fresh! My, they do sound good, something almost everyone would like! Your blog design is adorable. Your new blog layout is very springy and fresh! I like it. Yaaaaay Jaime, it looks fantastic! And I'm drooling over these potatoes - they are SO going on the To Make list this week! 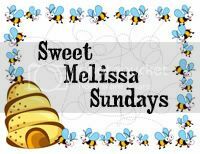 I came looking for a Sweet Melissa Sundays post, but I have to say I'm glad I found these potatoes instead. They look amazing! And now I'm starving...an apple for lunch does not equal awesome potatoes like I see on here. Sad. I am mesmerized by the new look. I can't look away! Yay! Sorry I am behind on my reader so I am just now seeing this. The blog looks great and I am glad you liked the potatoes! Very nice look to your blog -- fun is a word that does come to mind so mission accomplished if you ask me. I made these today for company and they were a hit. Easy to make at the last minute. I cooked some good bacon and broke it in course pieces and I shredded the cheese a day early. Putting it together was a snap just before we ate. Thank you.